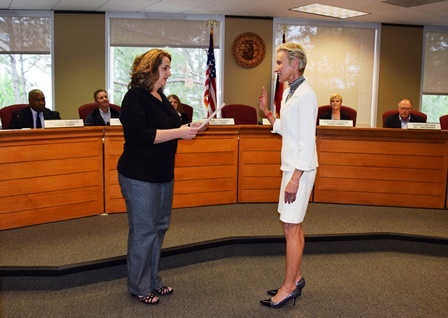 During a special Town Council session May 16, the election was canvassed followed by Mayor Laura Wheat and council members Alesa Belvedere and Michael Barrett taking the oath of office. We want to thank all residents who took the time to vote, as Westlake had a terrific turn out! About 43 percent of registered voters cast their ballot early, which is the highest number of early voters for Westlake in many years. Results in Tarrant County showed 461 votes were cast in the mayoral election, with Laura Wheat taking the lead over Colin Stevenson. The council member election between Michael Barrett, Alesa Belvedere, and Sean Kilbride drew 748 votes, with Michael Barrett and Alesa Belvedere taking the lead for re-election of the two council seats at-large. No ballots were cast in Denton County.